​Our emphasis on bicycle awareness begins with education. We have a number of courses in our standard curriculum and can also custom tailor courses to meet the needs of any organization. See our list of courses and sign up today! Whether you're looking for tips on how to fix a flat tire or how to overhaul your headset, Toledo Bikes! 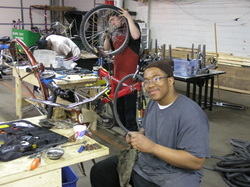 Park Tool School bicycle maintenance classes classes are for you. Get real, hands-on experience from professional bicycle mechanics and leave feeling confident with your new skills. Please note: Class format is prepared for students who are 16 years old and over. Wait List: If you are interested in a class that is full, we can send you email updates on future classes. If a space becomes available, we will contact you. Our youth programs have been very successful. Let us know your needs and we can custom design a program for you. Classes can be either at our state of the art facility or a location of your choice. Contact our Director of Education for details. Get added to a waiting list or send us ideas for the types of classes you would like to see.